INRIM and LNE-Cnam agreed to undertake a collaboration aimed to verify, through the use of metal–carbon eutectic fixed-point cells, methods and facilities used for defining the transition temperature of eutectic fixed points and manufacturing procedures of cells. To this purpose and as a first step of the cooperation, a Co–C cell manufactured at LNE-Cnam was measured at INRIM and compared with a local cell. The two cells were of different designs: the INRIM cell of 10 cm3 inner volume and the LNE-Cnam one of 3.9 cm3. The external dimensions of the two cells were noticeably different, namely, 40 mm in length and 24 mm in diameter for the LNE-Cnam cell 3Co4 and 110 mm in length and 42 mm in diameter for the INRIM cell. Consequently, the investigation of the effect of temperature distributions in the heating furnace was undertaken by implementing the cells inside single-zone and three-zone furnaces. 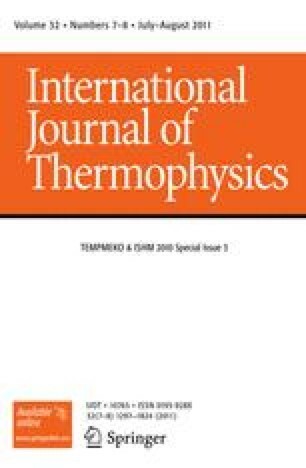 The transition temperature of the cell was determined at the two institutes making use of different techniques: at INRIM radiation scales at 900 nm, 950 nm, and 1.6 μm were realized from In to Cu and then used to define T 90(Co–C) by extrapolation. At LNE-Cnam, a radiance comparator based on a grating monochromator was used for the extrapolation from the Cu fixed point. This paper presents a comparative description of the cells and the manufacturing methods and the results in terms of equivalence between the two cells and melting temperatures determined at INRIM and LNE-Cnam.